This aluminium frame is secured to the toilet by the existing seat. 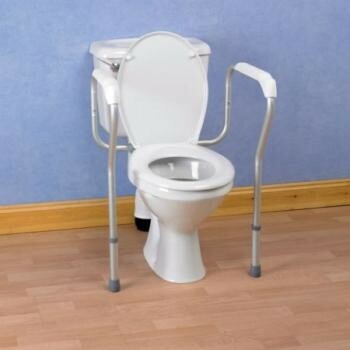 The legs are height adjustable to suit a number of toilets. Mouldings on the arms provide a secure handgrip and broad area for resting arms whilst on the toilet. This aluminium frame is secured to the toilet by the existing seat. The legs are height adjustable to suit a number of toilets. Mouldings on the arms provide a secure handgrip and broad area for resting arms whilst on the toilet. May be combined with a raised toilet seat provided the existing seat is left in place. Legs and arms may be easily removed when not required. Height of arms 640 to 750mm (25 to 291/2"). Width between legs 400 to 550mm (16 to 22"). Width between arms 387 to 537mm (151/2 to 211/2").